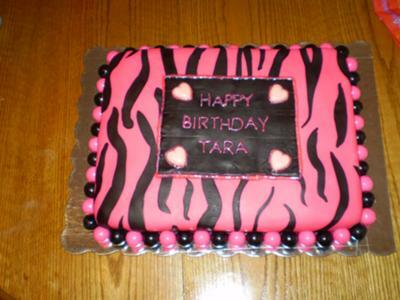 I made this Hot Pink Zebra Stripe cake for my son's girlfriends surprise birthday party. It was fun to make. I rolled out hot pink fondant, cut some zebra stripes with a pizza cutter, layered it on the pink fondant and carefully rolled the zebra stripes into the hot pink fondant. Then I covered my strawberry and whipped cream filled cake with the fondant. To finish it off I added hot pink and black gumballs as a trim for the bottom. They were a hit too. It was fun to make and it tasted great. Join in and write your own page! It's easy to do. How? Simply click here to return to Copy of Cake Pictures.